A new car-sharing service is coming to Berlin in 2019 from Volkswagen — and it’s electric! The recently announced service, We Share, will start with 1,500 e-Golf vehicles and expand with 500 e-up! cars, and later with VW’s next-generation I.D. EVs. Berlin isn’t the only city Volkswagen is bringing its service to, as it is launching in major cities across North America and Europe. In its announcement, VW’s spokesperson, Jürgen Stackmann, said, “From 2020, ‘We Share’ is to support the market introduction of the new generation of our new, all-electric I.D. 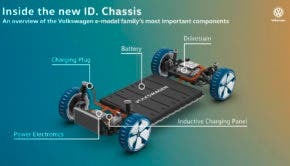 models and thus make a significant contribution to the Volkswagen brand’s e-mobility offensive.” This move immediately creates a market for its I.D. electric cars upon their 2020 arrival and entices younger generations to favor the brand. Berlin already has several popular car-sharing services: car2go and DriveNow. The first is a subsidiary of Daimler AG and boasts over three million members. Car2go is a huge presence in Berlin with approximately 223,000 customers in the city. DriveNow, a subsidiary of BMW, has a Berlin fleet consisting of around 1,400 BMWs and MINIs. It will be exciting to see how Volkswagen’s We Share compares to these already existing services. VW says it plans to use a “free-floating” structure which will allow customers to access the vehicles at any time and is optimistic that demand will be good. CEO Phillipp Reth stated, “The most conservative forecasts for Europe predict annual growth of 15 percent.” Only time will tell!